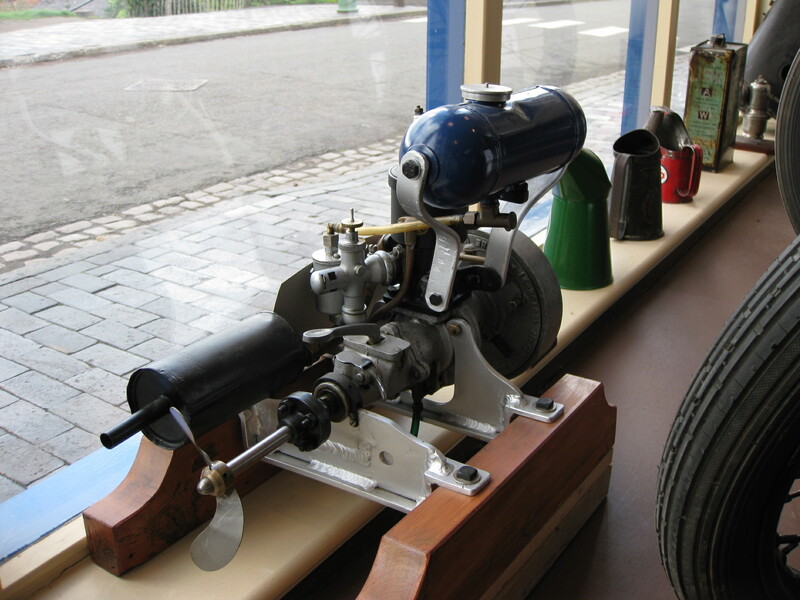 I saw this motor at a recent visit to a museum in cowes, I have never seen another outboard motor with a coolie had ignition and instead of a "JM" number it has a "TB" on the flywheel with Turner Bray on the cord pull, also for those in the know, it has a very rare flywheel nut which I would love to have and which dates this motor early 30's at my guess, I once bought a complete motor just for a flywheel nut like this one. Series 1 OA flywheel nut. Also the inboard version look much the same. That's Arthur Bray of the post war SD fame. Jerseyman I can get one those nuts made of you can let me have a drawing? 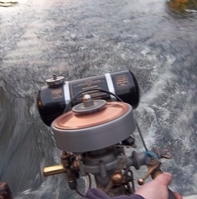 I acquired what is clearly a modified Turner Bray outboard about a year back and it has been lying around since. A couple of days ago I thought it was about time I looked at getting it running or see if it could be gotten running of course. As per the attached pictures we attached the motor to a wheelie bin and started investigating. It hasn't run yet despite dismantling the carb and checking the state of the spark pug and gap. My spark plug 'tell-tale' is indicating I'm getting no spark so courtesy of pictures online and the final one from the owner of another Turner Bray I now know I have to lift the 'flywheel' cover to investigate the electrics. I have plenty of experience of Series One land-Rover SU fuel pumps not wanting to start after a winter sat idle so I imagine the current issue will be related to the points being fouled up? 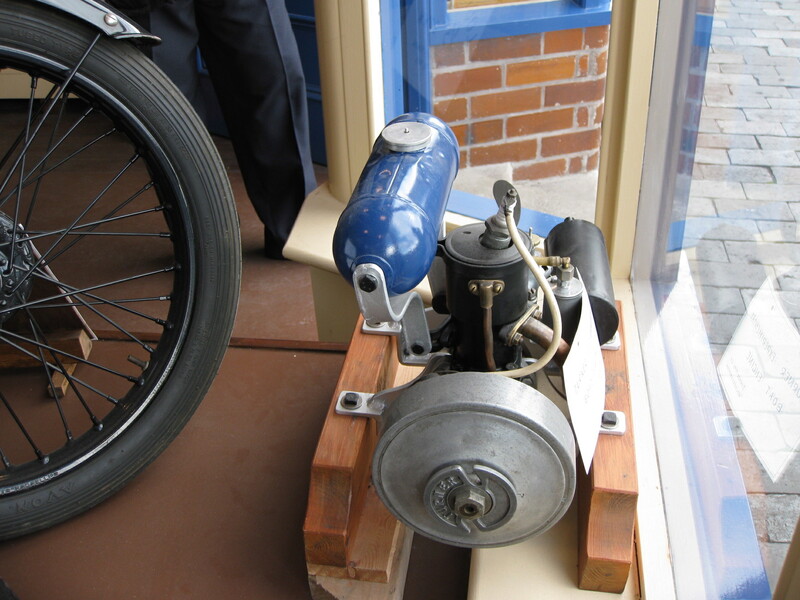 I hope to be taking this engine to the Glamis Motoring Extravaganza in July along with my Turner engine Land-Rover. Interesting top main bearing, a ball race, it can't get it's lubrication from the crankcase as there would be no primary compression if that was the case, so it must be lubed with a squirt from an oil can or it was meant to have seals! Remember that ignition coil is close to 70 years old! It also looks like everyone who used that ignition, stamped them so they could be kept as matching pairs! I think the 'coolie hat' flywheel was standard Villiers fare in the 1920's and 30's - The Atco Villiers lawnmowers of the day used the same magneto, and even came with a clip-on cover with a 'Villiers' logo enamel badge in the centre. Personally, I am of the belief that Villiers made the whole powerhead for the 'Marston' Seagulls - the Villiers factory was next door to one Sunbeam factory and very close to others, and being essentially part of the Marston family empire - why wouldn't you? Well having had advice from others I've determined the field coil was goosed so have ordered a replacement along with a 'correct' pattern spark plug lead. I made up a new lead from the coil to the points and bolted things back together. The new coil tested out at 3.8k so would appear to be good. I unscrewed the nut from the end of the spark plug to trap the spark plug lead (I suspect we may now not have a full electrical connection to the working end of the plug). It has resisted starting so far. I have ordered a replacement plug which I know has a proper threaded end. Am currently at work offshore so no further progress for a week. Well we are definitely getting a spark but, despite very repeated attempts to start it at Glamis, the engine wouldn't run. It was close when being pulled but not 'quite there'. It has been suggested it might be a carburettor issue??? Have you checked the points? I had a forty plus just this weekend where everything checked out exactly as you say, odd missfires gave me hope but it just wouldn’t get started. Swapped out carb, spark plug, HT lead, new fuel, no luck. Double checked the points, off by 5-10 thou even though I had just set them, retaining screw must have been loose. A tiny adjustment and it went on first pull, runs like a champ now. It had good spark the whole time so I assumed points were fine but what a difference a tiny adjustment made. Just my two cents! !